Cebu Pacific Promo Fares 2019 to 2020: Davao Flights Seal Sale at P399! Cebu Pacific Promo Fares: Book your Cebu Pacific flights to Davao now and enjoy a one-of-a-kind shopping adventure at the Big Davao Fun Sale this March 14 - April 16, 2014! International Destinations : Travel Period: March 14 to April 16, 2014.
is there any promo this month of january 2014? if there is a promo, how can i buy the tickets & how much will i pay? How about for me. From manila to roxas is thiere have a promo. What shoud I do to avail the fare ticket promo for this month of january. hi is there promo cebu to davao for the og august this year? 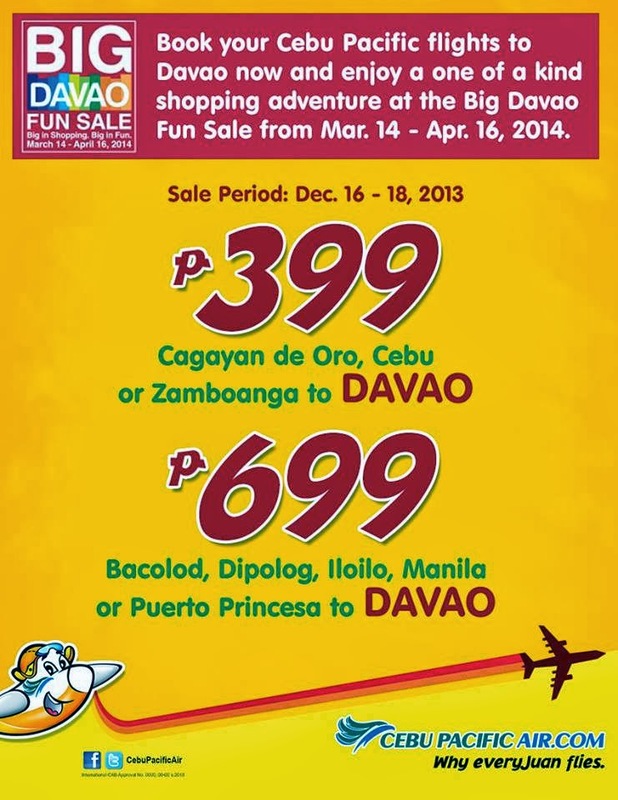 hi is there a promo cebu to davao for the month of AUGUST this year?